As a farmer and grape grower, the effects of climate change are hard to miss, and the news is getting worse. Even the best-case projections regarding temperature, sea level rise, floods, fire, disease, and agricultural output are frightening. Partly due to changes in the climate, extinction rates among all species are about 1,000 times greater than they would be in the absence of human activity. Pulitzer prize winning author Elizabeth Kolbert has called this phenomenon The Sixth Extinction. Ecologists and philosophers have started to wonder whether humans will survive the climate change experience, reminding me of a Tom Lehrer tune from the 1960s. Expecting that we will survive, my Christmas wish is that the resulting world will be the kind in which our grandchildren will still want to live. The immediate cause of changes in the climate is an imbalance between carbon storage in soil and other reservoirs and its release into the atmosphere as carbon dioxide, trapping heat and acidifying the oceans. (You can learn more about the carbon cycle here.) While burning fossil fuels gets most of the attention, modern agriculture, through deforestation, mechanical and chemical disruption of soil, and confined livestock facilities, has contributed as much as 40% of the increase in atmospheric CO2. It doesn’t have to be this way. Trees, grasses, and other plants carry out photosynthesis that uses the carbon from CO2 to produce sugars that are transported via the roots into the soil, feeding a diverse ecosystem of microbes, insects, earthworms, and even vertebrates. Agricultural approaches may thus be deceptively simple yet practical and potentially powerful methods to extract CO2 from air and store it as organic carbon in the soil. Research suggests that adding 0.4% more organic matter each year to agricultural land across the globe would sequester all the CO2 released by human activity. Is 0.4% per year additional organic matter achievable? Absolutely. Using cover crops and advanced grazing techniques, North Dakota rancher and farmer Gabe Brown has added organic matter at about twice this rate for 25 years, providing proof of principle. University of California at Berkeley Professor Claire Kremen has done the design work, USDA’s Sustainable Agriculture Research and Education program has done field trials and created educational programs and tools, and organizations such as Future Harvest CASA and county agricultural extension offices offer support, education, and knowledge sharing among farmers and landowners in our region. Put simply, while building soil organic matter may be only one part of an overall solution to global warming, it is literally “shovel ready.” The challenge now is spreading the word, creating the incentives, and putting on our boots. As we approach the start of the 2019 session of the General Assembly, there are several critical actions to take. First, we should hold Governor Hogan and the Maryland Department of Agriculture accountable. In 2017, the General Assembly passed the Maryland Healthy Soils Act that requires MDA to provide incentives that would improve soil health, monitor progress, and help the state meet goals set by the Maryland Climate Change Commission. Despite the promise, no new practices or incentives have emerged. To reinvigorate this program and regain climate leadership for the state’s largest industry, Maryland could join California in committing to the Global Soil Health Challenge. Second, state and county representatives should add a “carbon note” to all legislation. Proposed legislation in Maryland is always accompanied by a “fiscal note,” a brief description of the potential financial consequences of the bill. But fiscal notes don’t include other indirect costs to the taxpayers, such as the cost of global warming. In order to help legislators understand the benefits and risks of legislation on climate change, a similar “carbon note” could be required. The practice would help keep the issue front and center. There are also a few things you can do at home to return carbon to the soil. First, you can let your grass grow. As it grows, the ratio of carbon to nitrogen in the blade increases. In contrast, short cuttings (those that result from weekly lawn mowing) have high levels of nitrogen that, because there is little carbon to hold it, then leaches into ground water and the Bay. Infrequent mowing, annually is best, has other advantages. Less fuel and labor are needed, long roots improve soil structure allowing better water infiltration, and over time a natural meadow of diverse plants, insects, and wildlife will develop. Second, you can plant an edible landscape on even a small plot of ground. Americans often plant vegetable gardens during times of scarce resources. About 20 million households established victory gardens during World War II, and nearly half of all Americans grew their own vegetables during the early 1980s recession. The personal benefits include reductions in transportation (both from farm to market and market to home), better nutrition, and the sense of community that comes when everyone does their part. There are added benefits of incorporating these herbs and vegetables into the landscape in terms of soil health, reductions in pesticide use, and aesthetics. Because they sequester twice as much carbon as forestland, vineyards represent an excellent way to add carbon to soil. When we started, average soil carbon was less than 1%, and unmeasurable in some areas. Through cover cropping, reduced soil disturbance, and compost additions, we are up to about 2.5%, about the norm for most vineyards in the world, but we think we should go higher. Although conventional wisdom says that vines should struggle, we believe that additional organic matter will result in healthier, more resilient plants that will resist disease, ripen earlier, and have more flavor. At least this is the experience of some of the best châteaux on the left bank in Bordeaux. While storing carbon in soil is a simple tool to help solve the current climate challenge, the transition will not be easy. Agriculture is more perspiration than romance, and some of these methods are labor intensive. Farm labor is in short supply, and there will inevitably be a process of trial and error as we determine the right crops and cover crops for our environment and each agricultural product. In the short term, these factors could result in reductions in farm incomes. But long term, reducing CO2 and creating resilient landscapes is the best way to prevent, or at least mitigate, the catastrophes of climate change.And, of course, more carbon in the soil leads to more nutritious, flavorful food and wine, and that will also make our grandchildren’s world a better place to live. Tuesday, October 2 was a beautiful, if somewhat warm, autumn day – the kind of day that we hope for in early October, when we are typically just starting to pick the black grapes. But this, the final day of picking in 2018, signaled the perplexing character of the vintage. The image of Dodon’s weather vanes pointing toward each other on an otherwise lovely morning is its lasting symbol. The year started with brutally cold temperatures, as low as two degrees below zero (Fahrenheit) on the morning of January 7. While a few weeks of very cold temperatures has many benefits in the vineyard, we start to worry about bud viability when temperatures approach zero. In contrast, February was usually warm – speeding vine phenology - but March was cool – slowing the vines. Bud break occurred in the Chardonnay on April 15, about on-schedule, followed by freezing temperatures three days later. The next variety to bud, the Cabernet Franc, waited until May, indicating that a late year would ensue. Yet this isn’t what happened. Bloom, which typically occurs 45-60 days after bud break, arrived just 24 days later. Suddenly, it was an early year, requiring adjustments to already modified schedules for canopy management and sprays. The vines were confused by the temperature extremes, as were their human partners. Dodon’s vineyard manager, Roberto Gomez, finally thawed from winter pruning, complained of vertigo. And then it rained. And rained. And rained. The soil at Dodon is made up of about 50% solid matter – rocks, minerals, microbes, insects – and 50% pores, occupied by air and water. When the pores fill completely with water early in the season, the roots don’t have enough oxygen to develop normally. In response, the leaves produce more stomata (the structures responsible for evapotranspiration) than they would otherwise. The effect is to make the vines more susceptible to drought. So of course, drought came in early July, and the vines became stressed. As we finished irrigating the south slope, it started raining again, this time lots of it. Our colleague Jim Law of Linden Vineyards described it as biblical in its proportions. We had more rain in September than in the previous five Septembers combined. And when it wasn’t raining, it was hot and very humid. Most people correctly associate excess moisture, whether from humidity or rain, with molds and mildews. But by drowning the roots late in the season, excess rain causes the vines to focus on survival by growing roots and foliage, diverting energy from ripening. 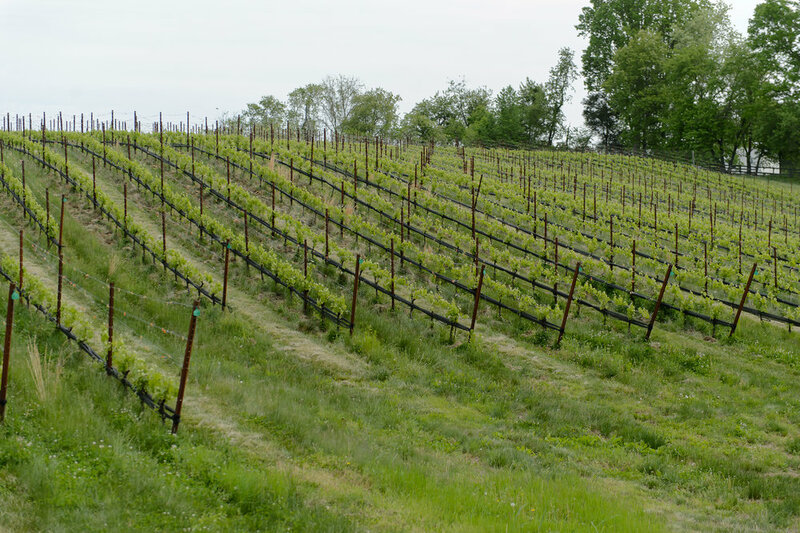 Our usual response to excess rain is to let the canopy grow higher, increasing evapotranspiration, and let the grass grow to create competition with the vines. But this year the amount of rainfall overwhelmed these measures. The canopy developed downy mildew, and the grass grew so quickly that we couldn’t keep it out of the fruit zone. The fruit ripened unevenly, with the ripest fruit falling prey to botrytis and other late season bunch rots. We sorted heavily while picking, leaving about half of the black fruit on the vineyard floor. To say that the vintage was, and remains, puzzling is an understatement. We never quite knew what to expect. The vines remained confused all year, with growing shoot tips appearing around the vineyard throughout September. This atypical behavior also occurred in other plants, particularly crab apples and magnolias that could be seen blooming throughout southern Maryland this fall. Decisions about picking were particularly uncertain. In mid-August, I told the team that I didn’t think we would begin picking for at least two weeks. Four days later, we picked the first of the Sauvignon Blanc followed by the Chardonnay, both from the east vineyard. We waited a week to pick the Sauvignon from the west vineyard. We also picked the black fruit earlier, and thus less ripe, than in the past. In the cellar, we extracted less aggressively, leaving behind the unripe tannins that cause bitterness. With less structure, the wines will need less oak and more stirring to achieve their potential. As a result, the 2018 red wines promise to be more accessible early in their life, and less age-worthy, than is typical for Dodon wines. Despite the challenges, or maybe because of them, I’m left feeling extraordinarily grateful for this vintage and the lessons that it brought. There were many bright spots. Our effort to create a balanced ecosystem seems to be working. The increasing diversity of insect life around the vineyard is stunning, and except for the occasional spot treatment, we didn’t use any insecticides this year. A mantid even joined us on the sorting table this year. While there was a bit of mold in the Sauvignon clusters, the white wines turned out beautifully. I’m especially excited about the Chardonnay, which has the depth, range, and vitality that we seek from this classic variety. The main lesson, though, is that the climate is changing rapidly. Over the last three years, old weather patterns have given way to prolonged periods of drought and rainfall. It has tested our farming and winemaking skills, the front of house team who rearranged plans daily, and even club members who had hoped to attend one of the seven rained-out Dodon ‘til Dusk gatherings. (Thank you for your patience.) These challenges will continue, especially in the mid-Atlantic where temperatures and rainfall are predicted to rise faster than in other parts of the world. In response to these changes, we need to think critically about how we can adapt and become more resilient. It’s crazy to irrigate in a year of record setting rainfall, but that’s what we needed to do. Fortunately there are solutions, some that we are already working on. Soil with good structure allows excess water to pass through quickly to the aquafers below. Soil rich in organic matter holds on to some of the water until it is needed by the plants. In the pastures, we can create this healthy soil using a technique called MOB grazing; in the vineyard, we can create it using appropriate cover crops with deep roots and plenty of residual biomass. As the year comes to an end, the 2018 vintage reminds me of Bach’s six suites for solo cello, performed wonderfully by Yo-Yo Ma. Each suite is based on a different French dance, and each is composed of six movements that span the range human emotion, none the same but all very beautiful. The same might be said of the variation that occurs between vintages, and in 2018, variation within the vintage. Like Bach’s cello suites, some vintages are deep and soulful, some sad and mournful, others light and lively, but all with their own exquisite charm. The lesson of this vintage is that we can succeed by dancing together as a community to nature’s varied tunes. Why is the winery open by appointment only? Tom. Dodon is home to three generations of our family, a fact that shapes all activities at the farm. When visitors come to the vineyard and winery, they are visiting our home, and as in our home, the space and the events that we host reflect our tastes and preferences – simple, yet refined and textured; modern, yet pastoral and hospitable; elegant, yet warm and intimate. And, as in our home, we plan gatherings at which we can be fully present and engaged with each of our guests. Polly. Because we are only open by appointment, we can organize our schedules to ensure that we can spend time with our guests. We want to share the Dodon story in a calm, comfortable atmosphere. The seated tasting format also emphasizes the role of the person hosting the tastings, who is not only knowledgeable about wine, but also an integral part of Dodon’s vineyard and winemaking. People are sometimes curious about why wine tastings at Dodon are by appointment and are seated. The short answer is that during our wine journeys, the tastings we have most enjoyed are the “slow” ones, the ones at which we engage in a deep discussion of the “hows and whys” behind the wines with a member of the winery’s team. In my last post on organic agriculture, I discussed the importance of balance in the vineyard, especially in the soil where microbes play a critical role in creating a healthy environment for plant growth. This notion of ecological balance is central to a form of organic agriculture known as biodynamics. In what has become a metaphor for the 2017 vintage, a black widow found her way onto the sorting table in the last hours of harvest. We’ve always known that there are lots of black widows in the vineyard, but mostly they keep to themselves, quietly helping rid the vines of unwanted insects. How she got to the table is anyone’s guess. It seems unlikely that she was on a cluster when it was snipped into an unsuspecting hand, so perhaps she crawled into a picking basket that inadvertently landed on her web. In either case, we popped both the spider and her grape into the sorting bin, and off she went to the compost pile. No harm done to either party. Dodon’s soils substantially differ from those in other wine growing regions. Termed Marr-Dodon complex soils, they are described as fine-loamy (meaning smallish particle size), siliceous (having high levels of silica that warms the soil), semiactive (modest cation exchange associated with low fertility), mesic (medium temperature), aquic (Dodon series) or typic (Marr series) (aquic soils retain more water than typic) hapludults (derived from sandstone). Why do we care so much about Dodon soils? Grapevines grow just fine in water supplemented with a few nutrients, a method known as hydroponics. Growing hydroponically has lots of advantages. Because it can be done indoors, hydroponics allows perfect temperature control, and it avoids disease pressure often associated with rain, humidity, and insects. Vegetative growth can easily be regulated by adjusting the amount of carbon dioxide in the atmosphere and the amount of nitrogen in the aqueous solution. It’s little wonder that tomatoes, lettuce and other vegetables, and most commercial marijuana are grown hydroponically. The red wines are now in tank, primary fermentations nearly complete, extended macerations underway, and the conversion from malic acid to lactic acid getting starting. While the next movement of the vintage is still being written, the personality of the growing season is now clear. Starting, as spring always does, with anticipation and hope, the rhythm quickly began alternating between moments of dramatic threat and pastoral idyll. Like Sibelius’ second symphony, the sense was that of an ongoing conversation between death and salvation, personified by increasing tension, fatigue, and anxiety before ending in a final heroic conclusion. Support for genetically modified organisms or GMOs got quite a boost this summer when the National Academy of Sciences released their most recent report on GMOs, concluding that, compared to “conventionally” farmed crops, GMOs have had generally, but not uniformly, positive effects on producer income and that they are safe to eat. To be sure, the NAS committee comprehensively reviewed the literature comparing GMOs with conventionally farmed crops, so from this perspective, it fulfilled its narrow statement of task. But many winegrowers will view the scope of the report as limited, comparing two largely technologically driven agricultural methods but leaving out more ecologically-based methods that rely on diversified ecosystems to improve quality and increase yields.